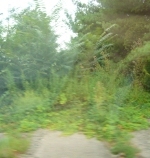 Album Info: Abandoned and preserved ROWs, routes and stations within New Jersey as well as historic views and sites. Description: A High Bridge Branch train at the Flanders passenger station in the early 1930s (or perhaps late 1920s). The passenger station was demolished after the end of passenger service in the mid 1930s, but the freight station remained in use and survives as a local jewelry and coin store. Description: This concrete landing is a remnant of the Delaware Lackawanna and Western Railroad swing span bridge that stood on the the Boonton Line over the Hackensack River until the current Upper Hack Lift was built in 1959. Description: Visible from the NJ Turnpike Holland Tunnel approach (Interchange 14C). This bridge stood over Erie's Pavonia Yard near the Jersey City terminal. 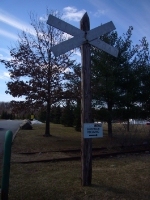 Title: NS (Conrail) Industrial spur at US Route 46: GONE! Description: Compare this to 2003.